Before I started this blog, I'd tried a few other attempts on for size. At first they were nothing more than diaries, not even searchable! But the most recent one before Fat City Fit was called The Joy. I had grandiose ideas about writing posts about doing almost everything better - working out, eating, finances, friendships, work etc etc etc all with the goal of finding more joy out of life. Ironically, just thinking about it took joy from my life because it was too big, not in my area of expertise and not all things I was passionate about. It fizzled in about 3 posts. It made me realize that while it's great to tackle big projects, they have to be projects you have the capacity to actually tackle and if you don't yet have the skills needed, you have to want to acquire those skills. I want to say I love finances and could write expertly on the topic, but I don't really care. I'm a careful saver, I have a kickass employee share plan and I really hope my husband will handle the rest. Is that pathetic? Old fashioned? I don't know but I do know that trying to act like I cared was stressful. Enough rambling. The reason I bring up the subject of joy or happiness is that I truly believe mental health is a key component of physical health. There's numerous studies showing that stress is at the heart of many disease, that depression breeds depression and that happy people live longer, healthier lives. Credit where credit is due; I was re-inspired to tackle happiness and joy because I'm reading The Happiness Project. While I am not necessarily looking to tackle a specific year long list of things to improve happiness, I did immediately come to two conclusions that would greatly improve my life. One was resolving to give my husband the very best of me (more on that and other specific 2013 resolutions shortly) and the other was to take time to enjoy the little things that make me smile. I assume smiling leads to more smiling. So I'm going to observe more and in on going posts I'll share the little stuff that brightened my day and I hope you'll share yours. Today's little thing seems so trivial but it literally always makes me grin and chuckle a little to myself. 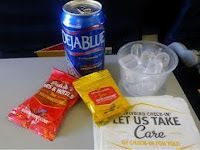 I fly Southwest Airlines a ton and I love them. I only drink water on planes (or the occasional vodka soda or bloody Mary but I'm usually in my flight attendant uniform so no booze!) 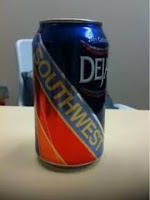 and Southwest has these hilarious cans of water. 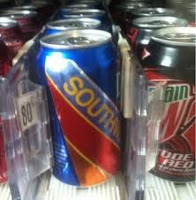 Not soda water or flavored water but literally regular (probably tap) water that comes in a can. 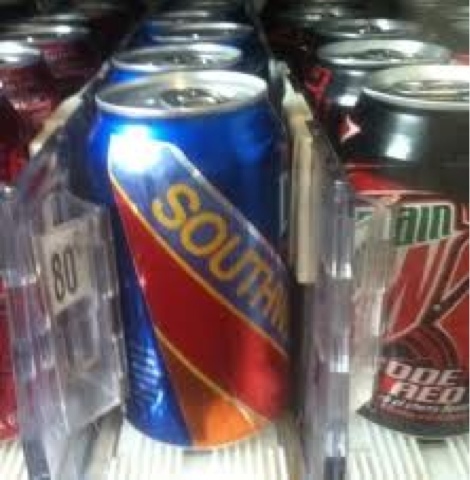 It's even branded for Southwest. I don't know why but this concept of water in a can seems so funny to me and whenever they offer me the whole can of water, I eagerly answer yes cause it never ceases to make me smile. It's ridiculous but who cares. A smile is a smile right?! (when searching for a picture to show what I was talking about, I realized I'm not the only person who finds these cans of water memorable!). What goofy little things make you smile? How does your mental health impact your physical health? Sounds like an amazing day! Love a relaxing day filled with your favorite things! Late to the party on this one but all the cherry blossoms in spring (here in Vancouver) make me smile every time.